We love what we do, and we’re proud of our unparalleled customer service. Check out real stories from real customers, below! We’re always looking to improve your experience with us! Some of the best suggestions come from our customers, and we welcome any and all comments. 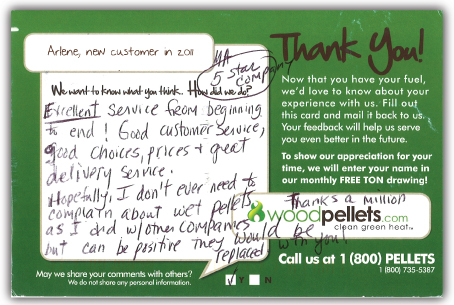 Please give us a call at 1-800-PELLETS, or e-mail our customer service team at sales@woodpellets.com to tell us how we did. Thanks! Read about our "perfect record" customer servicer award from the Better Business Bureau!